One day you gaze at your aquarium and notice a small snail on the glass. It looks harmless enough. A week later the snail has half a dozen companions. Before you know it, the tank is crawling with them. Where did they come from? How did they multiply so rapidly? More importantly, what can you do to get rid of them? Anyone who has fought the snail battle knows it is a tough one, but there are things you can do to keep them at bay. When you set up your tank there were no snails in it, so where did they come from? Snails usually arrive on plants in the tank, either as grown snails or as packets of eggs. Sometimes they arrive with the fish, having been scooped up when the fish was netted. All it takes is one stray snail or a few eggs, and you have a resident snail population in your tank. Perhaps the most astonishing thing about snails is how easily they multiply, especially when there was only one snail to start with. It only takes one snail, as most snails don't require a mate to reproduce. No need to find a snail matchmaking service, the lone snail fertilizes its own eggs, and voila, a couple of weeks later it becomes a single parent. Lucky you! Furthermore, it is not unusual for snails to spend their day buried in the substrate, coming out only at night to forage for a meal. That cute little snail you saw on the glass probably has dozens if not hundreds of siblings hanging out under the gravel. And you guessed it - each one of them can have children all by itself. It’s not surprising that your snail problem can mushroom out of control in no time at all. Even though the snail has the advantage of reproducing quickly, and can easily hide, you can still win this battle. All you have to do is use your superior brainpower. Snails can be lured out by simply clipping a lettuce leaf to the glass before you go to bed. In the morning there will be a whole family of snails feasting on the lettuce, which you will scoop out of the tank and dispose of. You won't eliminate every snail that way, but you can keep their numbers under control. Another option is to put snail-eating fish in your tank. Any respectable Clown or Yo-Yo Loach would give their right fin for a snail dinner. They will sift through the gravel, sucking any snail they find right out of its shell. Loaches will even dive under the substrate in their snail hunting quest. Labyrinth fish, such as Bettas and Gouramis, will also eat snails. However, they are not as adept at tracking them down in their home under the gravel. Lastly, remember the equation, less food = fewer snails. Reduce the amount of food your fish are given, and there will not be as much left over for the snails. Alum – Soak using one gallon of water and two tablespoons of alum. Soak plants for two to three days, then rinse well before planting in the tank. Bleach – Prepare a soaking solution using one gallon of water and a cup and a half of bleach. Soak plants for five minutes, then soak for another five minutes in plain water with a de-chlorinating agent, and rinse well. Be aware that fragile plants may be damaged by bleach solutions. However, bleach is the most effective way to kill snails and eggs. Potassium Permanganate – Prepare a soaking solution using one gallon of water and a half tablespoon of potassium permanganate. Soak for fifteen minutes, then rinse well before planting in the tank. 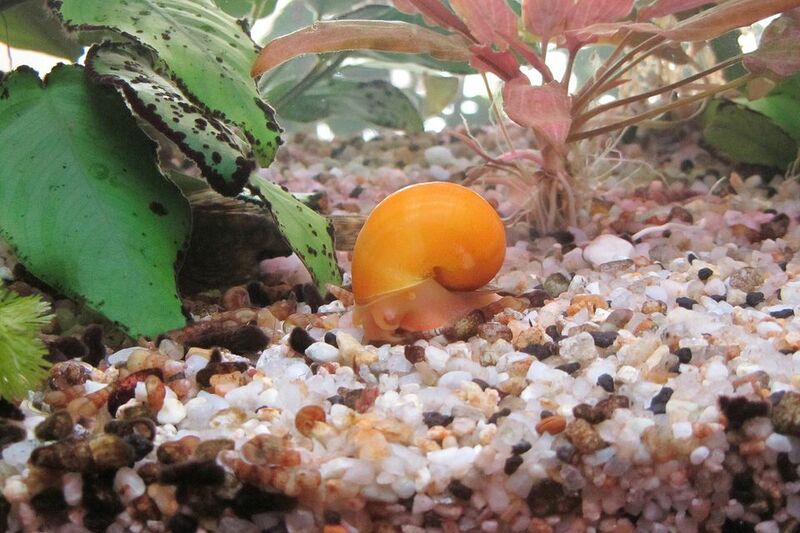 Remember that having a few snails in your aquarium isn't necessarily a bad thing, as they eat algae and eliminate food that isn't eaten by the fish. As long as you keep them at bay, they can work in your favor. What Causes Brown Algae in Your Fish Tank? What is the Best Way to Preserve the Slime Coat on Fish?